Retina support: The app is now optimised for Retina devices. Selection styles & controls: improved readability for the List and Columns library view modes - identify currently selected items more easily. 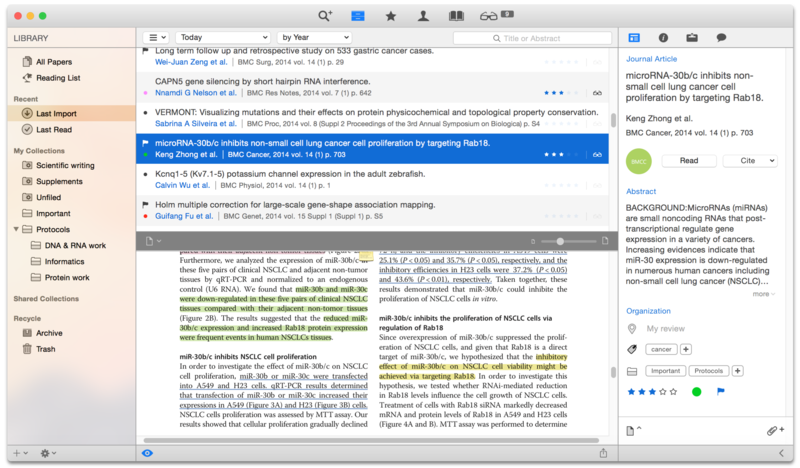 Overview Inspector: New "Read" and "Cite" quick link buttons for every paper in your library - speed up your workflow! Reader: Improvements to how tabs look in the Reader view. Annotations: A color selector is now present in the Reader bottom bar when adding highlights or underlines to a paper. Sources: The Sources drop-down menu is now more prominent when using the Sources view. Sources: ISSN is now available as an option in the Sources editor. Supplemental PDFs can now optionally be exported along with primary PDFs when using the File → Export… → PDF Files & Media option. Exported supplemental PDFs can now optionally have their annotations exported. Annotations made to PDFs in external applications can now be made editable within the Papers Reader view by using the View → Annotate → Extract Embedded Annotations option. Password-protected PDFs can now be opened within Papers 3 for Mac. PDFs associated with library items are no longer deleted when adding those items to the Reading List if "Move original file to Trash on import" is selected in the Preferences. Dragging a supplemental file to Finder now correctly copies the supplemental file rather than the primary PDF. Better sorting of shared collections: The imported date for papers added to Papers Online shared collections is now treated as the date that the paper was added to the shared collection (rather than the date the paper is imported into the user's local library). Consistent syncing status messages and status light indicators during and after syncing. Removes a cause of "Waiting for app shut down" messages and delays when quitting the app or shutting down your Mac. User preferences for some options such as page rotation and show / hide cover pages are now persisted between app launches. Changing the publication date in the Inspector Info tab now correctly updates the date in the Overview tab, the Reader screen tab and the List, Grid and Coverflow views. The "Page Thumbnails" view mode on the Preview pane & Reader has been temporarily disabled when running Papers 3 for Mac on OS X 10.10 Yosemite. This avoids a bug introduced in OS X 10.10 with PDF rendering that would cause Papers 3 for Mac to crash otherwise.